When it comes to commercial buildings, safety is of utmost importance. Large numbers of people are affected by electrical problems in commercial buildings such as offices, stores, hotels, and apartments. Electrical problems, when not recognized and repaired, can pose a fire risk. For their own safety and the safety of others sharing the space, each individual in a building should be trained to recognize the warning signs of electrical failures. If any of the following signs occur, call Varney Inc., commercial electrical contractors in Roanoke. Frequent flickering or dimming of lights. The electrical system may be over-extended, or there may be a short in the wiring somewhere. This can be repaired by a professional electrician. Wall outlet discoloration. This indicates electrical overheating that could result in a fire if not repaired. Call an electrician immediately if you see this. Tripped circuit breakers and blown fuses that occur repeatedly. This is a sign of overloaded outlets or circuits. The electrical system in your building needs to be repaired to prevent more serious problems. Appliances that deliver a slight shock when touched. Unplug the appliance and discontinue use until an electrician can evaluate the situation and take necessary measures. Use caution when moving televisions, computers, and monitors. Microwaves should only be serviced by a professional. Maintain and monitor electrical cords and plugs. Always unplug electrical appliances before working on them. Use the correct wattage for light bulbs and the correct amperage for fuses. Use extreme caution with portable space heaters. Proper use of electricity can prevent fires and electric shock in commercial buildings, saving the lives of the people inside. Allowing professional electricians to service and inspect your electrical systems will prevent personal injury. 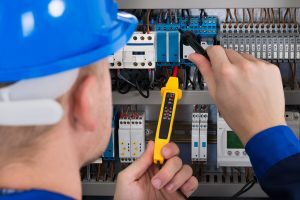 Varney Inc., commercial electrical contractors in Roanoke are ready and available to solve your electrical problems. Stay safe and let professionals handle your electrical systems. If you see any warning signs of electrical issues, call Varney at (800)456-1399 or (540)343-0155.